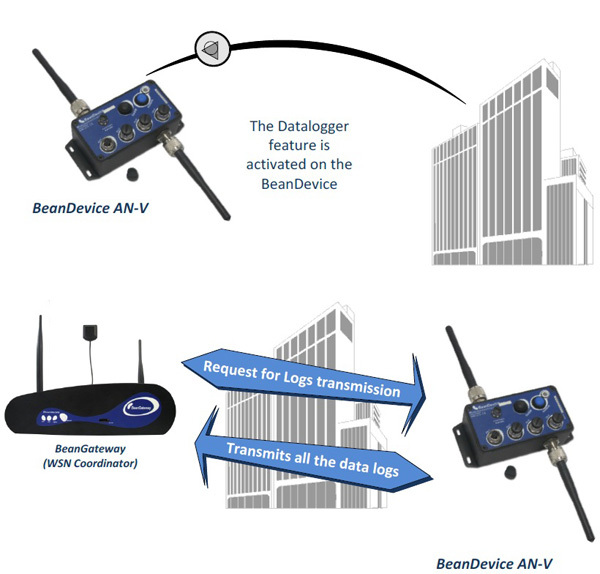 BeanDevice® SmartSensor series contain tri-axial (AX-3D, AX-3DS, AX-3D Xrange) wireless accelerometers as well as single-axial and biaxial inclinometers (Hi-INC, Hi-INC Xrange). Those wireless sensors are perfect for dynamic measurement on embedded equipment for vibration analysis, movement detection, structural health monitoring (SHM) and inertial measurement. With measurement ranges from ±2g to ±24g, BeanDevice® wireless accelerometers can reach a maximum wireless range (L.O.S.) of 390m and log up to 8 000 000 records in embedded data logger. They are fully calibrated sensor with ultralow power consumption <30µA (sleeping mode), and very low noise density at 45μg/√Hz. Rechargeable battery and watertight aluminium enclose IP66 ensures reliable operation for harsh industrial environment. Wireless tiltmeters with integrated data logger Hi-INC and Hi-INC Xrange are also suitable for antenna positioning, flight test measurement, benchmark on car frame stability and etc. Mono-axial and biaxial models are available for ±15° and ±30° angle measurements. 3 Axis accelerometer AX-3D Xrange Wireless range in LOS increases to 390m; Battery 1550mAh; 38.1µm flatness; 1.6µm roughness; Corrosion proof. Single-/Bi-axial inclinometer Hi-INC Xrange Wireless range in LOS increases to 390m; Battery 1550mAh; 38.1µm flatness; 1.6µm roughness; Corrosion proof. Based on inertial MEMS (Micro Electro Mechanical Systems) technology, BeanAir®’s line of wireless sensors, wireless data acquisition systems allow engineers to build their own architecture of wireless sensor network that enables remote monitoring and control tasks.Wireless sensor network gives the option to work away from the measurement sites, collecting and processing data without hassle or potential safety and health hazards. A wireless sensor network is composed of a wireless sensor (integrated with sensor power supply, micro-controller, radio transceiver and a data logger) and a network indoor / outdoor coordinator if required. BeanAir Sensors work on a network. 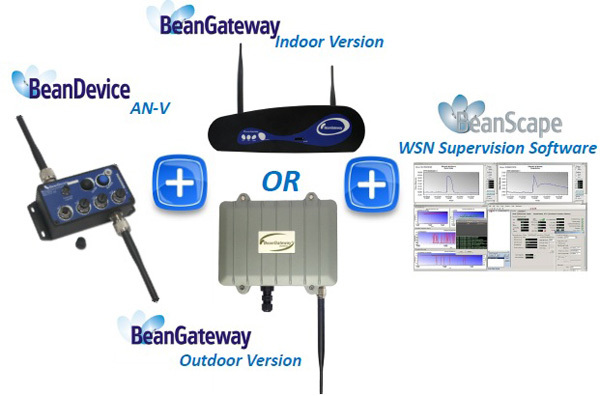 You will need a sensor (BeanDevice), a coordinator (BeanGateway) and an application (BeanScape) in order to form your network.BeanGateway is the network coordinator that coordinates between all the wireless sensors in the data acquisition network and the user work station.BeanAir® Wireless Sensors are based on MEMS (Micro Electro Mechanical Systems) technology and IEEE808.15.4 &GSM/GPRS wireless stack for platform communications. User can monitor and control the measured physical conditions (e.g. temperature & humidity, vibration, pressure, etc.) from their computer by installing the provided management software. Antenna diversity concept for excellent radio link (1Km). Please view videos relating to this product. Please complete the enquiry form below for specific information and advice on SmartSensor – Wireless accelerometer/ tilt sensor.